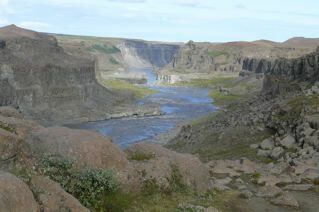 We leave Myvatn early on Sunday morning heading for Dettifoss. I decide to be really clever and take the ‘short’ route, road 862, instead of going the long way around through Husavik. So I’m going to save us a bunch of time on this trip, even though the Tourist information tells us to go the long way. Soon I can see why. The road is terrible. No, I mean terrible, easily the worst we’ve been on. Other than the reality of us being on this road, I would call it undriveable.Every few minutes I say maybe we should turn around, but of course with each tedious mile accomplished, it makes turning around even harder. We’re in a bad situation with no obvious solution. And this would be a nightmarish place to run into car trouble which seems a strong probability on this track. There is nothing around. Even by Icelandic standards, this is the emptiest , most barren countryside we’ve seen. We look in all directions for any sign of life but all we see are a few sheep. My outstanding 20/20 hindsight tells us I’ve erred in a big way, but guess what – nobody’s listening. 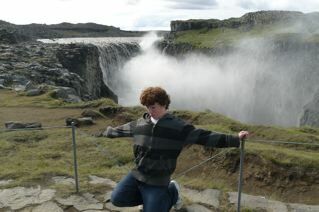 Eventually though we get to Dettifoss. There are a lot of vehicles in the parking lot which is surprising as we’ve seen a grand total of approximately zero on our route, so clearly they’ve taken another road. A better one. Nevertheless we’ve made it and we get out and wander around. It’s a lovely, easy walk to the falls which are huge and impressive. 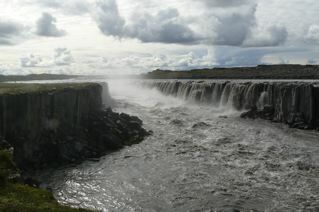 Even better is the further stroll to Selfoss, a smaller but wider falls which is very pretty but probably missed by most tourists. The path is on boulders of all sizes and great fun. Eventually we head back. Surprisingly, the road continues to be bad. It’s hard to believe this will continue all the way to Asbyrgi, but as it never appears to be getting better, it dawns on us that this is how we will spend a large chunk of the day. 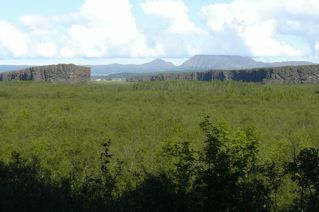 Miraculously we reach Asbyrgi, the gateway to Jokulsargljufur National Park. There’s a thriving minimarket, and the smartest visitor center one can imagine, and it comes with a very friendly ranger included. We do a couple of walks – we just don’t have the time for a big hike having driven the scenic slow route – but at least we see a little bit of the park. We head on to Husavik, where we’ll do some whale watching. It’s a spectacular drive along the coast. We get there minutes before a boat is due to sail, and my wife runs out to buy tickets. My son and I go park the car in downtown Husavik, (population 2,500) , about 50 meters away, and … we cannot find a spot. We never realized this could happen and we know time is tight. It’s Saturday afternoon in a tiny town and we’re running out of time because our very precise time management didn’t allow for no parking spots in Husavik, Which is probably historic in some way. We park in the Supermarket lot, full of warnings for illegal parking, and race to the boat waiting for us. In the rush we forget our food or extra clothes (our last meal was breakfast; now it’s 4pm) and so we spend much of the trip waiting for the pastries and hot chocolate that are offered in the brochure but cruelly are only passed out near the end of the trip. 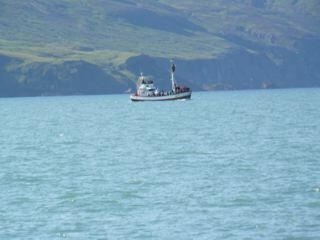 Unfortunately we only see 2 whales but a lot of puffins. We’re disappointed, but the day is gorgeous and we’re on the beautiful water so we’re not too upset. We leave Husavik (the car is untouched, seems I’m the only paranoid soul worried about parking regulations) and set off for Akureyri. It’s still light when we get in at about 8pm. The town of 20,000 is beautifully set on a fjord and appears to us like a metropolis, especially when I have to navigate traffic lights and traffic. 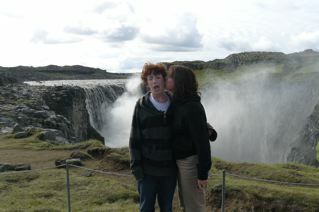 We’re staying at the Hotel Ibudir, which must be the best deal in Iceland. We have a kitchen, bedroom and living room for a great price, just off the main drag. It’s fun to walk through a street with real shops, cafes and restaurants so we stroll around before going to the Bautinn restaurant for our favorite dinner of soup and bread. Our mood is jovial; we’re in a real town with actual facilities, we’re in the non rainy zone and we’ve not yet destroyed the rent a car. How much better can it get ?